How To Prevent Frozen Pipes! Predictions are that we will hit the low 20's this evening so just a few tips on this link on how to prevent frozen and broken pipes: Hit this link: to get the low down and STAY WARM! What are the top five characteristics of properties requested by buyers on Mt. Hood? 1. Waterfront of any kind. Some buyers prefer the larger rivers but others with kids are more pleased with creeks. Pick your waterfront just to mention a few: Salmon River, Sandy River, ZigZag River, Still Creek, Clear Creek, Henry Creek, Boulder Creek, Rockway Creek and more! 2. View properties. Mt. Hood views are few and far between and only available up the LoLo Pass area. The surrounding hills of Hunchback mountain, Zig Zag Mountain and Sugarloaf are popular too. 3. Acreage. Any property with over an acre of land is high on buyer's lists. Most parcels over three acres are located off of Country Club, Barlow Trail and LoLo Pass Road. Due to surrounding Mt. Hood National Forest, BLM land and timber parcels, existing acreage for sale is difficult to find. 4. Seclusion. Yikes! Very difficult to find. If passing through on Hwy 26 you would think you were out in the woods when reaching the Hoodland Corridor. A community group is active in looking for a name change to be called the Villages at Mt. Hood. http://www.villagesmthood.us/ It's deceptive when driving by but once you get off the beaten path you will find a plethora of many dirt and gravel roads that take you to hidden homes and cabins. On deeded lands in tall stands of firs the typical mountain lot will be less than a quarter of an acre. In Government Camp lots are mostly 50 X 100. Many prefer the leased land cabins (560) in the Mt. Hood National Forest spread out along many creeks and rivers giving a feel of more seclusion and isolation. Ragging rivers and flooding hit the mountain on Monday, 11/06/06, with lots of damage to area homes and plenty of erosion. Sources say at the higher elevations 30 inches of rain hit within a 24 hour period. 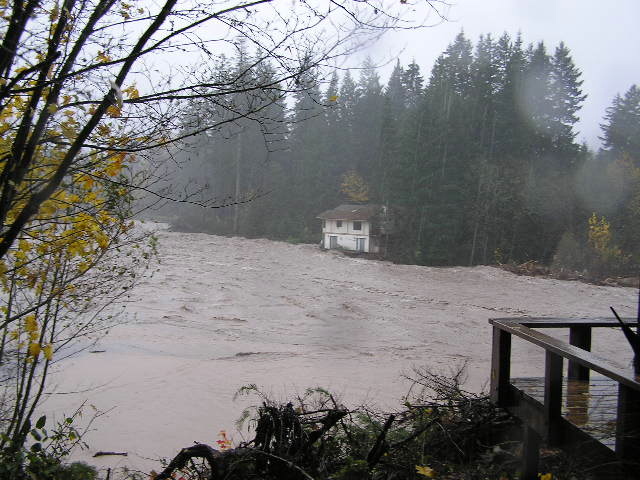 Lower elevations in Welches had 8 inches of rain in the same time. Eight foot waves carried huge trees and boulders down rivers. 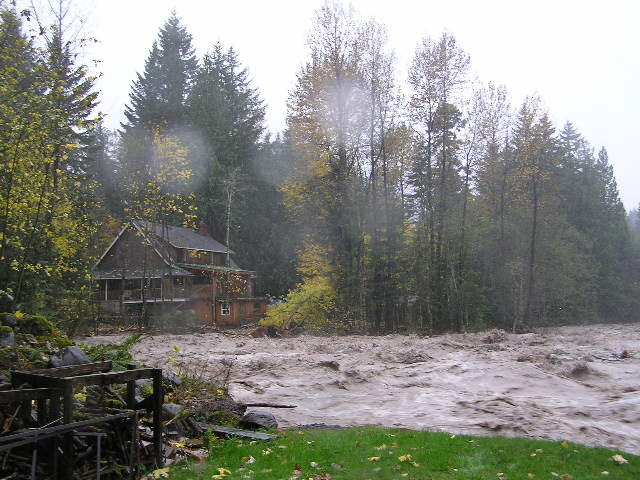 On Monday night the Sandy River was running at 4,000 cubic feet per second which is high and on Tuesday morning, it was running at 17,000 cubic feet per second. This was a much worse mountain event than the 1996 flooding. Pictured below is a home located on Riverside Drive in Timberline Rim. The shot is taken from the Sandy River Lane side of Timberline Rim. Half of this home went in to the river during the night. A couple of homes down from where this shot was taken a home was evacuated on the bluff due to river erosion below taking out their deck. The force of the river is eating away at their bank. This home below is located on LoLo Pass Road between the first two bridges. Luckily a log jam helped divert water away from the house. Many log jams formed along the Sandy River. One nearly million dollar home at the upper Barlow Trail Road area had the entire second floor taken out by the river. Unfortunately, their Lexus was in the river too. The owners were away at the time it hit. LoLo Pass Road was shut down all day as the river ate away part of the road. It's now open again but only one lane at this time. To top this all off, both roads in to Mt. Hood Meadows ski area are out of commission. Highway 35 at the Robin Hood Camp ground area is totally out.... shades of 1980 flooding when the entire highway was taken out from flooding and closed for the season. The White River Canyon side, Portland side access, let loose with debris and water. I'm sure the pressure is on for this area to get roads open for their pending ski season! We are all hoping the weather calms down so damage can be assessed and life returns to normal. ALERT: YOUR NAME IS BEING SOLD — TAKE ACTION NOW! Here's breaking news you need to know...and you need to let all your family and friends know right away as well. Having credit checked is an important and necessary step in the home buying process, as well as something that is done on a regular basis for any number of reasons — increasing a credit line on your Visa, applying for insurance, or buying a car. But very few people realize that each time their credit is checked, the "inquiry data" that the credit bureaus (Equifax, TransUnion, Innovis or Experian) has on file has now become a commodity. This information is being sold by the credit bureaus to other lenders...and also to companies that sell and resell the same names and personal information. That's right — the credit bureaus have found a way to increase their revenues at your expense...and without your permission. These "inquiry leads" include name, address, phone numbers (including unlisted), credit score, current debt and debt history, property information, age, gender and estimated income. They are selling your personal, confidential information to competing creditors...and making millions. Your privacy is being sold, not just once, but over and over again. And lenders that purchase these leads at a premium will then do everything they can to recoup their investment and turn a hefty profit. Super sneaky bait and switch tactics are being used to lure clients away from their reputable lender. Clients have even been called by disreputable lenders and told that the lender they had been speaking to previously "passed on" the information to them, because they knew that they'd be able to offer much better interest rates and terms. Ouch! The good news is that you can make it stop, right away. And pass this information on to everyone you know — your friends, family members, neighbors and coworkers. The consumer credit reporting industry has provided a way to "opt out" and remove your name from these lists. You can contact them by phone at 1-888-567-8688 or online at www.optoutprescreen.com. You must opt out at least 48 hours prior to having your credit checked to make sure it is processed in time. You can choose a five year or lifetime option, and the lifetime option does require a signed form. If a credit report needs to be run prior to the 48 hour waiting period — at least you are aware and informed, and can be on the lookout for suspicious phone calls or mailers from someone who has purchased your data. BONUS: Opting out will also protect you from "pre-approved credit offers" arriving via mail...one of the leading causes of identity theft in the US. You certainly have the right to shop for the best professional to meet your lending needs — but this should be done when and how YOU choose, not being done without your consent or permission. Looking around should be on your terms, not being done as a sneak attack, because they think you won't know better. And unfortunately, these unsolicited marketing tactics are a nuisance and intrusive, but quite legal. So take your privacy back. Take five minutes right now — opt out, and pass it on. Refuse to be a part of this system. IS 14.2% LOWER THAN A YEAR EARLIER. The 18th Annual Wine & Arts Festival at The Resort at The Mountain is the perfect setting for visitors to explore the works of local artists while tasting libations from Oregon's best wineries and microbreweries. Held November 11-12, the festival is the perfect excuse to start your holiday shopping, or just to escape to the mountain for a weekend.